Some recent reading and art. ALL of this. Encourage people to try new words, to mess them up, to experiment with vocabulary, to learn complicated adjectives and verbs and nouns, because words are fun. Also, don’t be a jerk. 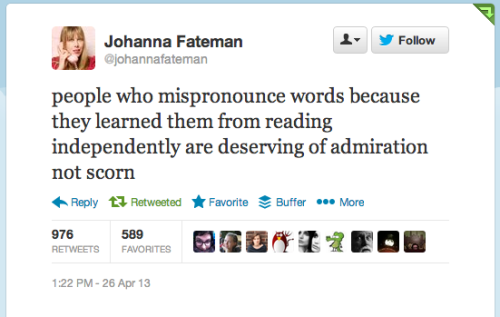 Posted in Interweb	| Tagged inspiration, mispronounce, Reading	| Comments Off on people who mispronounce words…..
Before June comes to an end.